Here are 4 letters and a sound that still resonates in the audience’s ears. 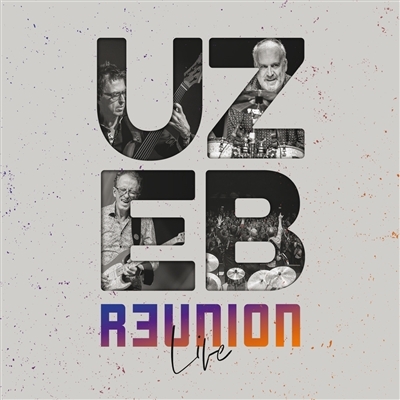 UZEB was considered to be one of the first Jazz Fusion groups in the world; one of the most popular and respected of the genre with over 500,000 albums sold and over 1000 concerts worldwide. Critics often noted that their innovative sound design was ahead of its time and their absolute musical mastery propelled the group to the forefront of the Jazz fusion landscape in the eighties. Today, (guitar) , (Bass) and (Drums) have reunited to offer once again the highestlevel of musical performance with The UZEB: R3UNION LIVE recorded during the tour 2017 in Canada and Europe. This double LP contains the best moments of these concerts accompanied by a horn section : Jean-Pierre Zanella, Jean-Nicolas Trottier, Jocelyn Couture, Alexandre Coté and David Bellemare among the best instrumentalist of the Canadian scene.